GLIFWC is an agency of eleven Ojibwe tribes in Michigan, Wisconsin and Minnesota, all signatories to treaties retaining off-reservation treaty rights. GLIFWC is committed to the implementation of its members’ off-reservation treaty rights to fish, hunt and gather in the ceded territories. GLIFWC is committed to the preservation and enhancement of the natural resources so harvest opportunities will be available for generations to come. GLIFWC strives to infuse Ojibwe culture and values into all aspects of its work. Formed in 1984, GLIFWC is an agency of eleven Ojibwe nations in Minnesota, Wisconsin, and Michigan, who retain off-reservation treaty rights to hunt, fish, and gather in treaty-ceded lands. It exercises powers delegated by its member tribes. GLIFWC assists its member bands in implementing off-reservation treaty seasons and in the protection of treaty rights and natural resources. GLIFWC provides natural resource management expertise, conservation enforcement, legal and policy analysis, and public information services. All member tribes retained hunting, fishing and gathering rights in treaties with the U.S. government, including the 1836, 1837, 1842, and 1854 Treaties. GLIFWC’s Board of Commissioners, comprised of a representative from each member tribe, provides the direction and policy for the organization. GLIFWC has two standing committees the Voigt Intertribal Task Force (VITF) and the Great Lakes Indian Fisheries Committee. 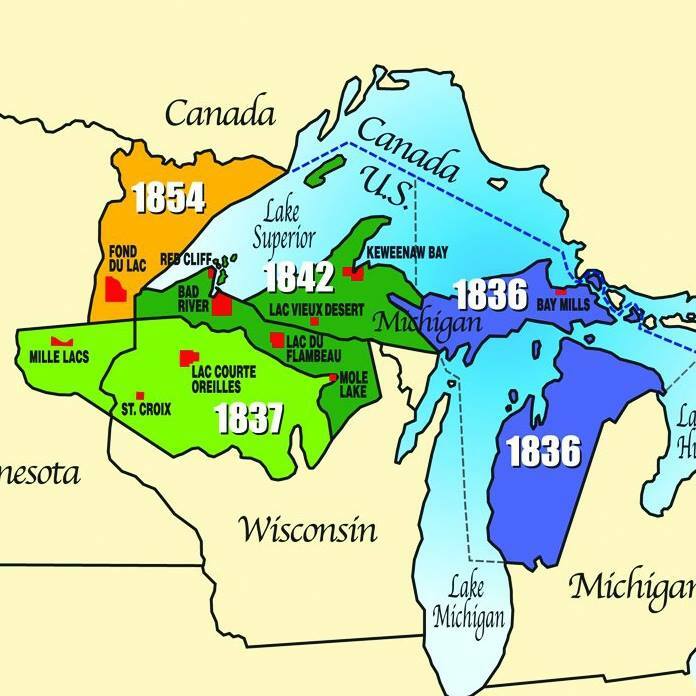 The VITF was formed following the 1983 Voigt decision and makes recommendations regarding the management of the fishery in inland lakes and wild game and wild plants in the 1837 and 1842 treaty-ceded territories. The Lakes Committee addresses matters pertaining to the management of the Lake Superior fishery and related issues. GLIFWC’s main office is located on the Bad River reservation, just east of Ashland, Wisconsin. A satellite office is also maintained in Madison, and enforcement personnel are stationed throughout the ceded territory. GLIFWC's work is divided among the divisions of Administration, Biological Management, Enforcement, Intergovernmental Affairs, Development and Planning, and Public Information.